Comic books and graphic novels have skyrocketed in popularity since the Marvel cinematic universe's inception. Some of the best writers and artists in the business are swinging into the medium too. Whether you like classic characters like Spider-Man and Batman, or more obscure titles like Battle Pope or Amory Wars, it's always a good idea to support your local Pinellas comic book store. Here are some of the best comic book shops in St. Petersburg, Clearwater, and the rest of the 727area. Conveniently located off 49th Street in Clearwater, Emerald City Comics houses one of the biggest comic, graphic novel, board game, and novelty floors in the area. Emerald City has served the Bay Area since 1989, with a huge inventory of back stock comics from Bronze, Silver, Golden Age, and Modern Eras, plus large shelves of graphic novels. They also offer a subscription service for free for Clearwater comic book fans who subscribe to three or more comics. Enjoy gaming? EC offers board game nights, special tabletop sessions, HeroClix, and more! Wilsons Bookworld has been serving St. Petersburg fans since 1971, making it the oldest full-service comic book store in the area. In addition to selling books, Wilson's has a whole wall dedicated to new comics and over 20,000 single issue back stock comics in their inventory. The best part -- all back issues are $1 each! Wilson's Book World also offers a computerized subscription service for free, with 10% off the cover price of all subscriptions pulled. Boasting 20,000 long boxes of comics, Missouri Comics has the largest inventory of single issues in the Tampa Bay area. From Bronze Age to Modern Age, first editions, variants, and signed issues. Missouri’s full inventory can be perused and purchased both online and in-store, and you can ship your purchases internationally9 or pick them up on site. This Safety Harbor comic book shop, located off 9th Avenue North, is a great place to discover new story arcs or stock up on old back issue comics. Comic World has served Largo comic book collectors since 1982, and advertises over 40,000 back issues, graphic novels, model kits, and a multitude of other novelties. As many comic book stores do, they also have a subscription service with a 15% discount, or 20% on prepaid, plus discounts for local schools and teachers. Don’t see what you’re looking for in the store? Comic World will order special items or out-of-stock prints to the store for you. Serenity Games is your one-stop shop (or play) for board games, tabletop role-playing games (RPG’s), card games, and miniatures. Serenity offers games for sale and space to play them, plus weekly meetups and tournaments. Board game nights happen every Tuesday, in addition to daily rounds of Final Fantasy, Pokémon, Pathfinder, and more. The Seminole game shop is even open late -- until 11 p.m. every night. Serenity now, or whenever! Located inside Westfield Countryside, this family-friendly Clearwater comic book store has comics, games, and novelties for all ages. Single-issue comics are available for a subscription pull service at 10% off the cover price. If you’re interested in card games, Magic: The Gathering games are hosted every Friday night. Comics and Hobbies also has locations in Palm Harbor (at 33871 US Highway 19 N) and Lakeland (at Lakeland Square Mall). Yancy Street Comics has two locations -- this Port Richey comic book shop, and another off Hillsborough Ave. near Tampa Bay Downs, so you have twice the stock to peruse! They offer a single-issue subscription service if you're looking to order your favorite stories weekly, or an online eBay store for collectible and exclusive items. Yancy Street has books, graphic novels, statuettes, vinyl figures, and other featured gifts in stock in both locations and online. 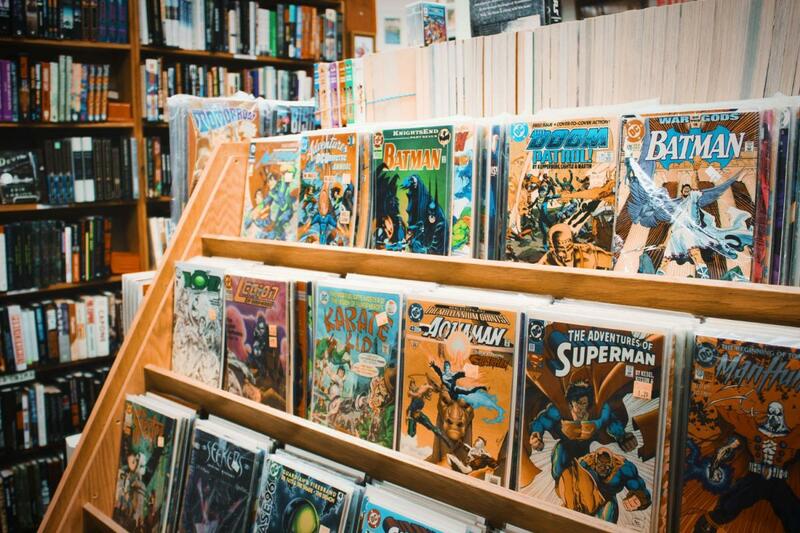 Whether you're looking to read more stories of your favorite heroes from the silver screen, or searching for a gift for a friend, it's always a great idea to know where your local comic book shops are in the 727area. While you're sifting through the best collection in the multiverse, take a look at the local restaurants and events happening near you; and don't forget to subscribe to the site. It's free!